Romanis was born in West­min­ster, and at­tend­ed Em­man­u­el Coll­ege, Cam­bridge (BA 1846, MA 1849). From 1846 to 1856 he was As­sist­ant Mas­ter in the Class­ic­al De­part­ment of Chelt­en­ham Coll­ege. Sub­se­quent­ly, he was Cur­ate of Ax­min­ster, Devon, then of St. Mary’s, Read­ing, where he published two volumes of sermons. 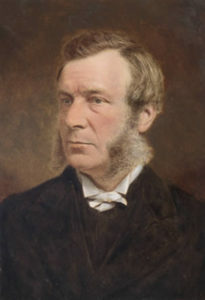 In 1863 he be­came Vi­car of Wigs­ton Mag­na, Lei­ces­ter, and was one of the leading “Ritualist” (High Church) clergymen of the area, calling for considered reform within the Church of England and its worship. In 1888 Romanis read a paper to his Deanery Chapter, subsequently published, arguing: “The right attitudes of Christians …towards change in matters of religious life, is neither one of blind hostility, nor of equally blind and capricious welcome, but of calm and careful examination of its character… It should be growth, or reform…The Church which cannot reform itself…has ceased to grow.” Later the same year he became Vicar of of Twy­ford, Hants. He re­tired in 1895 and died in Southsea, Portsmouth, Hants. Romanis is today best remembered as the writer of successful hymns, a number of which remain in use after their first publication in his Wigston Magna School Hymns published in 1878. These include “Dark Lies Before Us”, “Lord, Who Shall Sit Beside Thee?” and “Pour Down Thy Spirit”. However, the one which remains in the standard repertoire down to today with a number of different musical settings, most commonly the 17th century German hymn tune Seelenbräutigem, is “Round Me Falls the Night”.